A rich dessert that's luscious year-round. 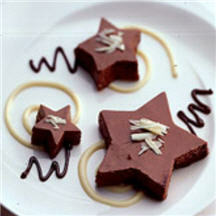 Cut the chocolate mixture into stars for a Christmas gathering or hearts for your Valentine's Day dinner. Chill a small mixing bowl and the beaters of an electric mixer. Meanwhile, line an 8x8x2-inch pan with plastic wrap, extending the plastic wrap over the edges of the pan; set aside. In a heavy medium saucepan melt chopped chocolate or chocolate pieces over very low heat, stirring constantly until the chocolate begins to melt. Immediately remove from the heat; stir until smooth. Set aside. In the chilled mixing bowl combine whipping cream and 1 tablespoon of the liqueur or milk. Beat with the chilled beaters on low speed until soft peaks form (tips curl). Cover and refrigerate for up to 2 hours or until needed. In a heavy small saucepan stir together egg yolks, remaining liqueur or milk, and sugar. Cook and stir with a wire whisk over medium-low heat until mixture is very thick (about 8 minutes). Remove from heat; pour mixture into a medium mixing bowl. Add the melted chocolate, 2 tablespoons at a time, to the hot mixture, beating on medium speed until combined (the mixture will be thick). Add 1/2 cup of the whipped cream mixture; beat on low speed until smooth. Gently fold in remaining whipped cream mixture. Spoon the mixture into the prepared pan, spreading as necessary to make an even layer. Cover and freeze about 4 hours or until firm enough to cut. Invert the frozen mixture onto a waxed-paper-lined baking sheet. Carefully remove plastic wrap. Using 1, 2, and 3-inch cookie cutters, cut shapes from chocolate, dipping cutters into warm water between cuts to prevent sticking, if necessary. Cover and return shapes to freezer until serving time. To serve, drizzle plates with melted white and/or dark chocolate, if desired. Top with chocolate cutouts. If desired, garnish with shaved white chocolate. Store any leftovers, covered, in the freezer. Make-Ahead Tip: Tightly wrap and freeze the cutouts up to 1 day ahead. Nutritional Information Per Serving (1/6 of recipe): calories: 518, total fat: 42g, saturated fat: 25g, cholesterol: 191mg, sodium: 44mg, carbohydrate: 35g, fiber: 3g, protein: 6g, vitamin A: 22%, vitamin C: 1%, calcium: 7%, iron: 10%.